WHAT IS THE PURPOSE OF THE ENTERPRISE ZONE? WHAT QUALIFIES AS “BUILDING MATERIALS” ELIGIBLE FOR THE SALES TAX DEDUCTION? Building materials that are eligible for the enterprise zone sales tax deduction include items that are permanently affixed to real property such as lumber, mortar, glued-down carpets, paint, wallpaper and similar affixed items. WHAT IS THE SALES TAX DEDUCTION AND WHAT IS THE RETAILERS ROLE? 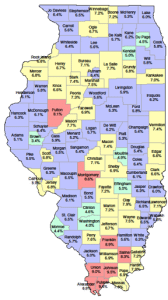 Each retailer who makes a qualified sale of building materials to be incorporated into real estate in an enterprise zone established by a county or municipality under the Illinois Enterprise Zone Act by remodeling, rehabilitation or new construction, may deduct receipts from such sales when calculating the tax imposed by this Act. For purposes of this Section, “qualified sale” means a sale of building materials that will be incorporated into real estate as part of a building project for which a Certificate of Eligibility for Sales Tax Exemption has been issued by the Illinois Department of Revenue (IDOR). To document the exemption allowed under this Section, the retailer must obtain from the purchaser a copy of the Certificate of Eligibility for Sales Tax Exemption issued by IDOR. WHAT IS THE ENTERPRISE ZONE PROPERTY TAX ABATEMENT INCENTIVE? The Revenue Act 35 ILCS 200/18- 170, as amended provides that any taxing district may order the county clerk to abate (that is, to give up) any portion of its taxes on real property, or on any particular class thereof, located within a zone and upon which new improvements have been constructed or upon which existing improvements have been renovated or rehabilitated. WHO IS THE MACOMB/BUSHNELL ENTERPRISE ZONE’S ADMINISTRATOR?